As Gospel Messengers, our goal is to carry out the Great Commission of our Lord Jesus which is one of the most significant passages in the Holy Bible. First, it's the last recorded personal instruction given by Jesus to His disciples. Second, it's a special calling from Jesus Christ to all His followers to take specific action while on this earth. We do this by reaching out to the unreached, especially in the rural areas of Uganda where people live in extreme poverty and disease. Gospel Messengers focuses on Evangelism, Social Welfare, Education, Agriculture, Health Care, and National Resource Development. Social Welfare includes helping the children. Because of war, drought, famine, and AIDS, tens of thousands of children in Ugandan bush lack the basic necessities of life, such as food, clean water, adequate clothing and housing, sanitation, education, adults to care for them, and an opportunity to learn that God loves them. Imani Milele Children, a branch of Gospel Messengers, touches the needy with the love of God by teaching His Word and giving practical help. It cares for more than 3,000 Orphans and Vulnerable Children. Without Gospel Messengers, children in these remote villages and their families would be left destitute. 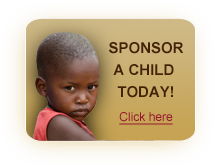 There are many ways to help, including child, community, and educational needs. You can be God's instrument of mercy and love, giving to a destitute child or a impoverished community. With your contribution, you are not only giving to the needs, you are giving hope through Jesus Christ! We are thankful for you and we appreciate your contribution.